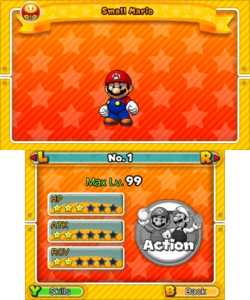 Small Mario's basic stat information. In Puzzle & Dragons: Super Mario Bros. Edition, a list of character statistics can be found in the game's menu under Guide, which shows the character's attribute(s), their max level, their HP/ATK/RCV ratings, and their Skills. This page lists such statistics. No. : The character's number as listed in the Guide. Max Level: The maximum level a character can reach. HP: The character's HP rating, listed in stars (out of 6). ATK: The character's ATK rating, listed in stars (out of 6). RCV: The character's RCV rating, listed in stars (out of 6). This determines how much health they can recover for their team with Heart Orbs. If the field is blank, the ranking is 0. Attribute(s): The character's attribute (or element). Their main attribute is the first element (located on the top-left corner of their card), and the sub-attribute, if any, is the second element (located on the lower-right corner of their card). Skill: The character's Skill, with the default turn amount, and an in-game description. Helper/Leader/Awoken Skill: The character's second Skill, if any, with an in-game description. Cells are blue for Helper Skills, yellow for Leader Skills, and green for Awoken Skills. Raises ATK and RCV of your Fire team members by 1.5x. Raises ATK and RCV of your Wood team members by 1.5x. Raises ATK and RCV of your Water team members by 1.5x. Raises your team's ATK by 2.5x after attacking with 3+ attributes at once. Raises your team's ATK by 3x as long as your HP is 50% or more. Raises ATK and RCV of your Fire team members by 2x. Raises ATK and RCV of your Wood team members by 2x. Raises ATK and RCV of your Water team members by 2x. Raises your team's ATK by 3.5x after attacking with 6+ combos. Raises ATK and HP of Fire team members by 1.5x. Raises ATK and HP of Wood team members by 1.5x. Raises ATK and HP of Water team members by 1.5x. Raises your team's ATK by 3.5x after attacking with 4+ attributes at once. Raises ATK and HP of Fire team members by 2x. Raises ATK and HP of Wood team members by 2x. Raises ATK and HP of Water team members by 2x. Raises your team's ATK by 5.5x after attacking with 5 attributes at once. Raises your team's ATK by 4.5x as long as you have full HP. Raises your team's ATK by 3x after attacking with Fire, Wood, and Light. Raises your team's ATK by 4x after attacking with Fire, Wood, Light, and Dark. Raises your team's ATK by 3x after attacking with Water, Light, and Dark. Raises your team's ATK by 4x after attacking with Water, Wood, Light, and Dark. Raises your team's ATK by 3x after attacking with Fire, Wood, and Dark. Raises your team's ATK by 4x after attacking with Fire, Water, Wood, and Dark. Raises your team's ATK by 3x after attacking with Water, Wood, and Light. Raises your team's ATK by 4x after attacking with Fire, Water, Wood, and Light. Raises your team's ATK by 3x after attacking with Fire, Water, and Dark. Raises your team's ATK by 4x after attacking with Fire, Water, Light, and Dark. Raises ATK of your Wood attribute team members if you clear a horizontal line of Wood Orbs. Raises ATK of your team members. Raises ATK of your Water attribute team members if you clear a horizontal line of Water Orbs. Raises HP of your entire team. Raises ATK of your Fire attribute team members if you clear a horizontal line of Fire Orbs. Raises ATK of your Light attribute team members if you clear a horizontal line of Light Orbs. Increases HP healed by clearing Heart Orbs. Raises ATK of your Dark attribute team members if you clear a horizontal line of Dark Orbs. Prevents paralysis if you're lucky. Recovers a small amount of your HP on each turn your clear Orbs. Recovers a small amount of your HP on each turn you clear Orbs. Raises ATK and attacks two foes for each of this ally's attributes that you clear 4 Orbs for. Avoids blind status if you're lucky. Avoids poison status if you're lucky. Reduces number of turns required to first use Skills upon entering a course. Increases the time the player can move Orbs by a short amount. Raises your team's ATK by 4x after attacking with 7+ combos. Raises your team's ATK by 4.5x after attacking with 8+ combos. Raises ATK by 3x if you clear 2 Dark combos, or by 4x for 3+ Dark combos. Raises ATK by 3x if you clear 2 Light combos, or by 4x for 3+ Light combos. Raises ATK by 2.5x if you clear a Fire combo, or by 4x for 2+ Fire combos. Reduces damage received by 80% if your HP is at 100%. Raises ATK by 2.5x if you clear a Wood combo, or by 4x for 2+ Wood combos. ↑ 1.0 1.1 Mario Combo and Luigi Aura increases the ATK of all teammates by 1.2x when attacking with 2 combos or more. ↑ 2.0 2.1 Super Power and Super Aura increases the ATK of all teammates by 1.4x when attacking with 3 combos or more. ↑ The in-game description for Twinkling Star is slightly inaccurate. It actually increases the ATK of all teammates by 3.5x when attacking with 4 attributes or more. ↑ Shining Star's in-game description is incorrect. It actually increases the ATK of all teammates by 5.5x when attacking with 5 attributes. ↑ 6.0 6.1 6.2 6.3 6.4 6.5 6.6 6.7 6.8 6.9 This Skill does not stack when another Coin Boost is already in effect. ↑ 7.0 7.1 Spin Control increases the ATK of all teammates by 2.5x when attacking with 3 attributes, 3.5x with 4 attributes, 4.5x with 5 attributes, and 5.5x with 5 attributes, plus Heart Orbs. Heart Orbs count towards smaller multipliers. Any Skill that raises a stat of teammates of a certain attribute applies to those with that attribute as their main or sub-attributes (if any): examples are a Fire, Fire/Wood, or a Water/Fire teammate. As a side-effect, any boosting Skills also apply to those teammates' opposite attributes (a Fire/Wood teammate's Wood ATK or a Water/Fire teammate's Water ATK would be raised). Any Leader/Helper Skill that raises teammates' HP or RCV do not take effect until entering a course. When the player's current Leader transforms into White Tanooki Mario or White Kitsune Luigi temporarily, they retain their stats, attributes and Skills until a battle ends. For this reason, they do not have entries in the Guide. Similarly, "Bowser and His Minions" is the only enemy to not have a Guide entry. There are no Fire/Water or Water/Dark attribute team members in the game. As Leaders and Helpers are not fought at all, excluding Bowser and Dry Bowser, they do not have Action animations. For this reason, Bowser the Koopa King is the only form of Bowser with this distinction. Excluding Leaders and Helpers, any teammates that appear with the digital update to version 2.0 have Action animations. All seven Koopalings, Bowser Jr., Bowser, and Dry Bowser have two distinct animations. For the Koopalings, the first animation is them spinning their shell and slamming into the screen; the second them firing a magic blast from their wand. For Bowser Jr., the first animation is taking out a Bob-omb and throwing it at the screen; the second is slamming the screen with the Junior Clown Car. For Bowser, the first animation is him swiping with his claws; the second is blowing a large stream of purple fire. For Dry Bowser, the first animation is swiping with his claws; the second is emanating a static aura before blowing a large stream of purple fire. Additionally, all of the mentioned characters stop appearing as enemies after they join the player. This page was last edited on April 8, 2019, at 17:23.